Carolina Beach and Kure Beach, NC – The arrival of autumn brings mild temperatures, more room to explore the beaches’ natural settings because of less crowds, and of course, spectacular fall fishing at Carolina Beach and Kure Beach, located on North Carolina’s southeast coast. With more comfortable fishing conditions and larger species like red drum, king mackerel, flounder and more, fall is ideal for an angler’s getaway. Whether a novice or experienced angler, visitors can hit the water on a charter expedition, compete in a tournament, or cast a line off a fishing pier to reel in a great catch. For beginner and experienced anglers, head to the Carolina Beach Fishing Pier and Kure Beach Fishing Pier. Both piers are easily accessible from the beach and provide opportunities for a varied catch. Kure Beach’s 711-foot pier is one of the oldest on the Atlantic Coast. Fishermen from there have access to king mackerel, spanish mackerel and other species that are normally found in deeper waters. At the Carolina Beach Fishing Pier, anglers can spot bluefish, flounder, speckled trout and even striped bass, towards the end of November. Neither pier requires a permit to fish and both have tackle shops on-site for the perfect bait, including minnows, bloodworms and shrimp that are sure to lure in the vast majority of fish. Visitors with a license can try their hand at surf fishing on the shores of Carolina Beach and Kure Beach. Head out early in the morning to cast a line into the water for a chance to reel in black drum while watching the sunrise. For a fee, anglers can pay to drive on the beach at Freeman Park. Located on the north end of Carolina Beach, Freeman Park has great access to fishing along the beach and Masonboro Inlet. For a more secluded spot, head to Carolina Beach State Park, boasting 761-acres and some of the best fishing spots in the area, as well as a marina for fishermen to dock their boats. Fort Fisher State Recreation Area at the south end of Kure Beach is another off-the-beaten path locale where fishermen can walk over the dunes to fish or drive along the beach after paying a small fee. For more experienced anglers hoping to reel in a larger catch, Carolina Beach offers fishing charters out into open waters. Charter services like Batson Charter Boats, Carolina Island Charters and Second Wind Fishing take visitors offshore with state-of-the-art fishing equipment for an afternoon like no other. Travel to the salt marshes or undeveloped barrier islands in the area to find blue marlin, yellowfin tuna, mahi mahi, wahoo and other exotic species. The North Carolina Wildlife Resources Commission’s Fort Fisher Boating Access Area provides a launch point for kayaks and other small boats. The Basin and Buzzard’s Bay – two legendary fishing locations – are easily reachable from the access area. For an opportunity to fuel the competitive spirit, the Pleasure Island Surf Fishing Challenge will take place Oct. 21-23. A premiere land-based tournament with over $20,000 in cash and prizes, the event is family-friendly and welcomes all fishermen and spectators to join in on the fun. Carolina Beach offers the best of a North Carolina beach experience from the past with a fun, family-friendly spin for today. 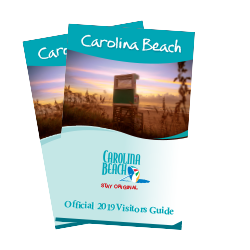 Visitors can experience a vintage, nationally recognized boardwalk, Carolina Beach State Park, one-of-a-kind festivals and events, world-class fishing, miles of beautiful beach, and all kinds of people united by their love of good times that are unmistakably Carolina Beach. For more information, go to www.VisitCarolinaBeachNC.com or call (800) 641-7082. Find us on Facebook at www.facebook/CarolinaBeachNC and Twitter and Instagram, @CarolinaBeachNC. Kure Beach, North Carolina’s small wonder, offers a naturally beautiful setting in a peaceful, small-town atmosphere. The coastal community, with its relaxed pace, lets visitors reconnect while they enjoy nature unspoiled and nearby signature state attractions, including the Fort Fisher State Historic Site and the North Carolina Aquarium at Fort Fisher. Kure Beach visitors can escape the busy pace of life and embrace the curiosity and innocence of childhood in this pure and natural playground. For more information, go to www.VisitKureBeachNC.com or call (800) 631-1460. Find us on Facebook at www.facebook.com/KureBeachNC and Twitter and Instagram, @KureBeachNC.